Kayaking Greenland. 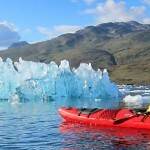 A week paddling among icebergs and glaciers. Using soundless kayaks and in total freedom, we will travel across part of the Arctic. Kayaking Greenland, a genuine sea expedition through icebergs, losing contact with civilization for a week… On our trip, we will have the exclusive privilege to explore several fjords on kayak, which will allow us to discover labyrinthine system of islands and outcroppings of land. To top it all, a spectacular walk into the mysterious ice cap in the very same place where all major crossings from south to north of the Greenland Inlandis start. Since we will be sailing in an area of calm water and because of the stability of our double kayaks, previous experience in kayaking is not required (although is recommended). However, given that this trip is more sports based than other expeditions, good overall physical condition is required, as well as being aware of the effort involved. Flight from Reykjavík or Copenhagen. Reception at the Narsarsuaq airport by our English speaking guide and boat transfer to the city of Narsaq. Once settled in our “Kayak Hostel” off we go to our supply store to get kitted out with clothing and navigation accessories. Night in the hostel. Transport by zodiac boat to Qingaarsup island, where we will start the kayak expedition. 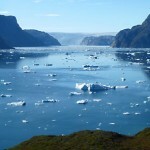 We will follow the coast along the ice covered fiord among the icebergs coming from Eqalorutsit glacier. In this area, full of ringed seals, there is usually a greater density of ice, slowing down the kayak and sometimes even blocking access at certain locations. When we start the crossing to Nuulussuaq peninsula through we get the first views of the Inlandis, the polar cap. Once we arrive to Nulussuaq, we will install our camp and have a spot which was one of the Viking settlements in South Greenland. 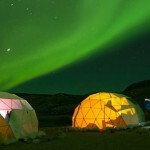 Night in tents. 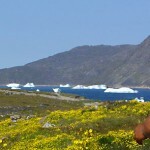 We will paddle through a setting of low-slung islands, with waterfalls and alongside leafy tundra which contrasts with the blue and white of the icebergs. Kayaking among ice provides us a special feeling of Arctic Nature. 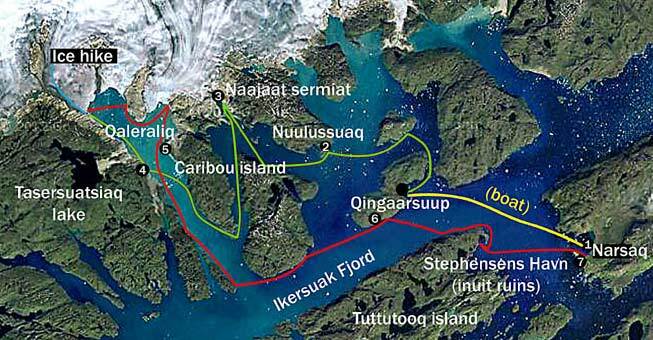 We will sail in Maniitsup Tunua fjord, surrounded by the peninsulas of Maniitsop, Niaqornap Nunaa and Nuulussuaq. 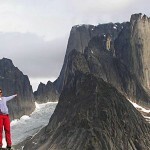 We are just in front of the ice cap, camping no so far away from Naajaat Sermiat Glacier Font. This is time to allow our senses to enjoy the unbelievable views of one of the oldest masses of ice in the planet. Night in tents. Today, we are sailing around Akuliaruseq island (also named Caribou island) which may allow us to admire this fauna approaching the coast or include the glacier front. Sailing along Qaleraliq fjord, we will arrive to Qaleraliq glacier with its three glacier tongues nearly 10 km wide. 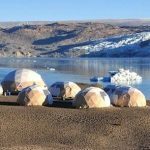 We will camp in a sandy beach and, if weather conditions and time allow it, we will ascent to the base of Tasersuatsiaq lake and his privileged vista of the infinite Inlandis or the inland ice sheet of Greenland. At night, enjoying the thundering sound of the seracs breaking away in the area’s magical silence. Night in tents. After breakfast we paddle for about 4 kilometers until the end of the fjord. Then, the hike is going to be a easy climb along the last ice tongue, enjoying the sights of the rimayas (transverse cracks) as we approach the moraine that leads to the immense icy plateau to the north of the island. Back on the kayaks we will continue the navigation along the glacier fronts, admiring the beauty of their vertical ice walls. We will install our camp in Caribou island. Night in tents. We are about 15 miles from Qingaarsuup Island, where we are heading to today. After going around Maniitsoq Island we take a new route to the large Ikersuaq fjord, facing again the huge icebergs and ice arcs of the Eqalorutsit glacier. Seals, of course, but this is also an area where the chances of seeing whales are greatest. Night in tents. We will cross the Ikersuaq fjord towards Stephensen bay in the island of Tuttutooq. This was a inuit settlement called Manitsuarsuk. Ruins of the settlement can be seen. Our kayaking will continue towards Narsaq or we might be ending here and be transferred by boat to Narsaq. Free time to stroll around in the city to see the museum, the inuit market, the church or the leather shop among others. Night in the Kayak Hostel. Boat transfer to Narsarsuaq, where we can visit the Bluie West One Museum, former US military base frozen in time since the Second World War. Qooroq Ice Fjord optional excursion: Sea route to Qooroq Ice Fjord, the most active glacier in southern Greenland. We will navigate among blocks of ice until the density of ice is such that we can no longer continue. You can’t imagine the sight of huge icebergs floating chaotically around us! (76 € per person, 6 participants minimum). Flight Narsarsuaq-Reykjavík (domestic airport) / Copenhagen. Special discount for June’s departures: -100€! From 25th of June to 02nd of July.